It was a laser-studded dream that took the cat-loving internet by storm. 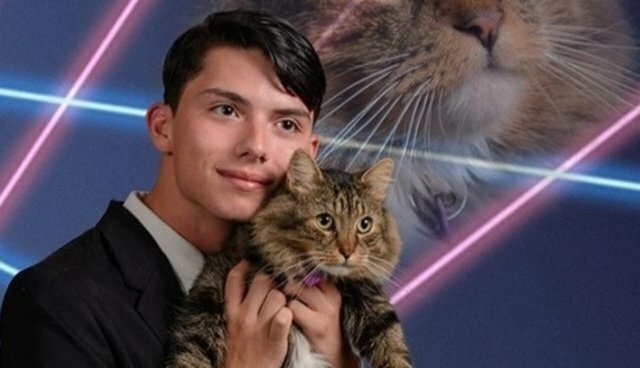 Last week, Schenectady High School student Draven Rodriguez launched an online petition in the hopes that it would convince school officials to allow this amazing photo, featuring his cat Mr. Bigglesworth, to appear in the yearbook as his senior portrait. More than 7,200 people added their signature in support of Rodriguez's cause, but that wasn't enough to sway the school to let the photogenic feline be featured alongside the other students' portraits, all of which would be woefully lacking in cats. According to the Daily Gazette, the Schenectady, New York school district's spokeswoman Karen Corona announced that the photo couldn't be used as Rodriguez's senior portrait, but that they'd "reached a compromise that everybody's happy about." Instead, the cat photo will be featured on Principal Diane Wilkinson yearbook page - along with a photo of her and her dog, taken by the same photographer, and also set against a backdrop of neon lasers. The page will also contain a message encouraging people to adopt pets from animal shelters. It's not the sweeping victory that many had hoped for, but it's hard to complain about the outcome. "We wanted to make sure that Draven knows that we appreciate his creativity and energy around this, and we wanted to do something out of the ordinary with it," says Corona.